adjacent teeth, the jawbone, or nerves. They are also more prone to tooth decay and gum disease, because their hard-to-reach location and awkward positioning makes brushing and flossing difficult. What does it mean if they are impacted? Your dentist may take a panoramic x-ray to evaluate for the presence and alignment of your wisdom teeth and refer you to Dr. Falke for extraction. Your oral surgeon may recommend that your wisdom teeth be extracted even before problems develop. This is done to avoid a more painful or more complicated extraction that might have to be done a few years later. Removal is easier in young people, when the wisdom teeth roots are not yet fully developed and the bone is less dense. How are wisdom teeth removed? The relative ease at which your oral surgeon can extract your wisdom teeth depends on their position and stage of development. Your oral surgeon will discuss general anesthesia and be able to give you an idea of what to expect during your consultation. 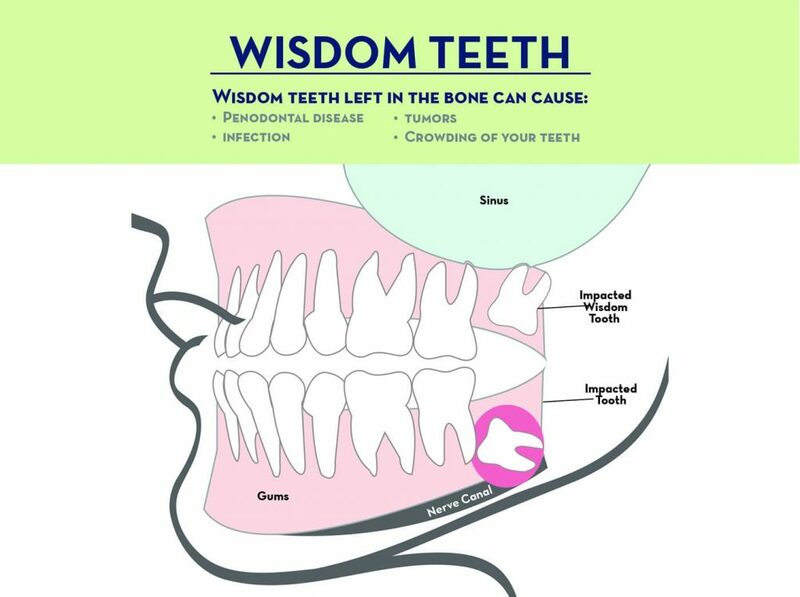 Wisdom teeth often require an incision into the gums and then removal of a portion of bone. The teeth will then be extracted in small sections rather than removed in one piece to minimize the amount of bone that needs to be removed to get the tooth out. Most people are back to normal activities in 3-5 days following surgery.